We finally see who has a shot at the crown. Heading into matchday 13 of the R6 Pro League NA Division, nothing was certain. With DarkZero Esports slipping up last week and allowing Evil Geniuses a stay on the throne, it’s clear that anything could happen. DarkZero was absent from play due to a bye week. Team Reciprocity sat in third, just three points behind the top. Rise Nation looked to keep their momentum to stay on top of Excelerate Gaming. Let’s take a look at how matchday 13 went down for the NA division. Rogue squared up with Rise Nation to kick off the night. Neither team is in contention for a spot in Milan at this point. Rise desperately needed a win, though, to avoid slipping back into relegation. Teams settled on Border as their map of play. Maverick, Buck, Valkyrie, and Maestro were banned out of play. Spencer “Slashug” Oliver grabbed two Rise attackers within the first 30 seconds of round one, but somehow Rogue let Rise push a four-vs-two to a one-vs-one. Rise was able to take away two attack round wins—an improvement over their one attack round victory last week. Apostolos “Hyper” Kontopanagiotis proved to be a lethal part of Rise when he cutdown several Rogue defenders to take a round four win. Rogue answered Rise with a shutdown in round five via a strong Armory hold. Rogue led 4-2 at the half after crushing Rise’s attack efforts. Hyper managed to clutch up against a Zofia plant in round seven to secure an ugly defensive win for Rise, but it wouldn’t be enough. Rogue would force a win at 7-5. Overall, the match up between Rogue and Rise was a back-and-forth balance of skill and oversights. Rogue really had nothing to gain or lose in this match since it was their last match of the season. Conversely, Rise needed all the points they could grab if they wanted to stay out of relegation. For Rise, everything rested on Excelerate Gaming’s performance. The second match of the day saw Excelerate Gaming meet with Spacestation Gaming on Bank. Commentator Parker “Interro” Mackay noted that SSG would need a win here to even be able to dream of going to Milan, but in order for that to happen every team above them would need to take a loss as well. Hibana, Jackal, Smoke, and Echo were all banned out of match. Braden “Chala” Davenport snagged a sneaky round three defuse by hiding in the stack of dead bodies that had tried before. SSG managed a perfect site rotation in their defensive run—catching a lead of 3-0. Khalil “B1ologic” Pleas slapped SSG with an impressive 3K, but EXG was unable to grab a round win. B1ologic showed an impressive show of skill, but Chala was there to shut down the momentum. EXG finally found a win in round five after SSG slipped up. With the fresh taste of victory still lingering, EXG would clean up a round six victory. The match stood at 4-2 in SSG’s favor at the half. After the switch EXG continued to pick up the pace in the form of a 6-5 match standing, ending SSG’s hopes of going to Milan. As Robert Flynn pointed out, SSG had thrown a bit of shade towards EXG before the match on Twitter. SSG managed to force a draw at 6-6. It was a sad display to watch, but ultimately one team seemed to want it more than the other. With SSG now out of the running for a spot in Milan, the top teams can rest easy knowing the competition has been thinned out. EXG will now continue to keep their heads above water and out of relegation. Evil Geniuses and Team Reciprocity closed out the day in a high stakes match on Border. EG looked to lock in their finals spot, while Rec fought to climb into second place. Glaz, Jackal, Maestro, Echo were the teams’ chosen bans. Troy “Canadian” Jaroslawski locked in the first round by cleaning up the two remaining Rec defenders who were attempting to get the defuse. 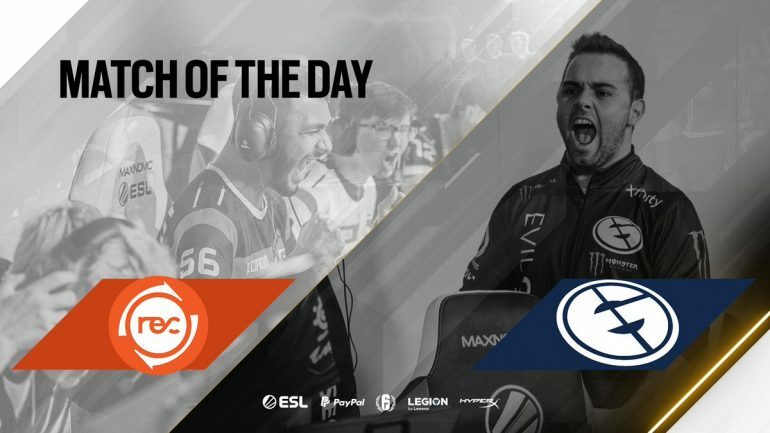 Davide “FoxA” Bucci went on a small frag fest in round two to show EG what they would be dealing with throughout the match and it seemed to catch EG off guard. Emilio “geo” Leynez Cuevas whipped out a 3K in round five to take back the lead for EG. The match turned over at 3-3. After a rehost requested by EG, the team managed to tie things back up at 4-4 after a loss to Rec in round seven. Rec closed in on Austin “Yung” Trexler and Canadian in round nine, but again, EG answered them by breaking the tie at 6-5. For the second match of the day fans got a back and forth match that saw a lot of mistakes and a lot of great plays. It was a low frag game, with the top fraggers on both teams racking up less than 10 kills. FoxA was left up in the one-vs-three clutch scenario, but the weight was too great and the odds were stacked against him as soon as he entered that situation. EG has locked in their spot at the Milan finals, and Rec will have to wait until next season for their shot.